Adventures in baking: is it ok to say it’s the thought that counts? I had a win on her first birthday because her great grandma, a renowned cake maker within the family, said she would bake her a (free-from) cake. As you can see from the first photo, it looked amazing and tasted even better. This year she hasn’t been very well so to save her the stress I thought I would have a go. If it wasn’t for Freya’s food issues I would quite happily buy one – as I make no secret of the fact that the only reason I cook is to eat – but finding one (or even someone who will cook one) free from almost everything is difficult so…it’s on me. I picked a morning following a night with even less sleep than usual for Freya and I to try out a recipe (I figured being tired would make me worry less about the mess and/or burning things). As you can see, Freya is much better at baking than I am but with this success came delusions of grandeur, aided by my friends Pinterest and YouTube. I wasn’t just going to make a cake, I was going to make her Ana (or at least a cake in the shape of a dress with an Ana doll stuck in the middle). Go me! I went with the plan for a couple of weeks, watching more videos, seeking advice from cake-making friends, before chickening out and deciding to scale things back (as I didn’t have any of the tins or the doll needed). Instead I thought I’d make one of those rainbow cakes that seem to be popular at the moment. As you can see from the photo above, the trial three tier didn’t turn out quite as expected. (I sent a photo of it to my husband and I got a message back saying: “What is it supposed to be?” That can’t be good). So I’ve scaled things back a little more. To a blue (ice) cake and an Elsa topper with suitable snowy scene and Freya’s name in bunting (cardboard). The only trouble is that Freya was with me when Elsa was purchased and she has now been incorporated into her toy collection. Hopefully I will be able to wrestle if off her on cake day. I’m in an absolute panic quietly confident that all will be well but just in case, it’s totally fine to produce the cake with great ceremony with the words: “Hey, it’s the thought that counts!” Right? Well that’s just the thing, I can’t get Freya to eat cake at all! She will lick the icing 🙂 Thank you for your good wishes, I will need them. 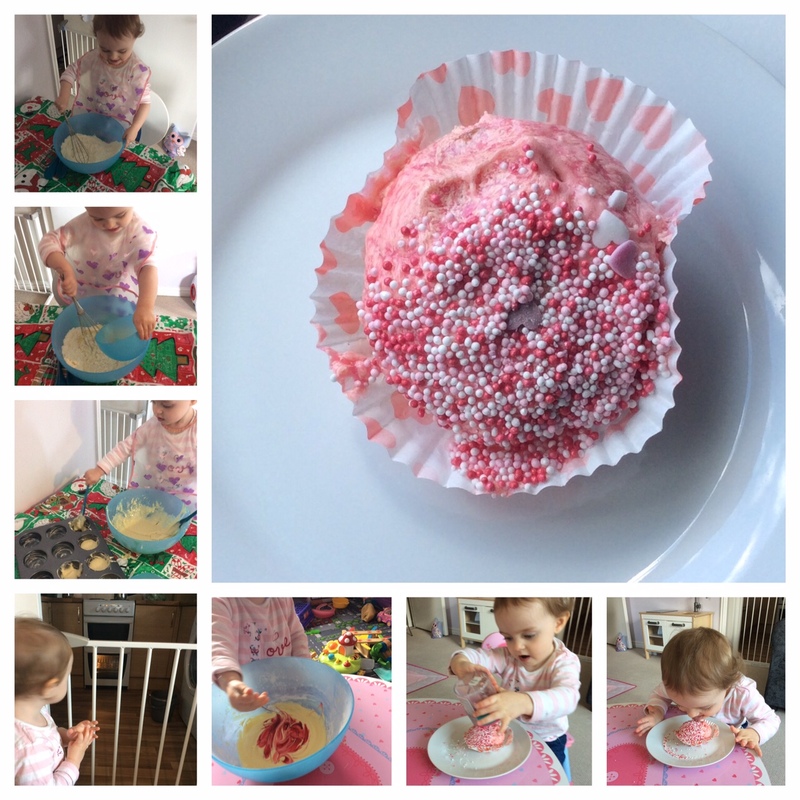 A girl after my own heart – I’m an icing fiend! Can freya eat nutella? We had chocolate cake today with layers of nutella which was pretty epic! That sounds lovely. I’m not sure if she can have it, I’ll have to investigate. That looks bloody great! Free from cakes aren’t the easiest of cakes to make, and look at your rise! I’m used to freaky coloured cakes, my brother always used to make green cakes 🙂 I’ve just watched Great British Bake Off and there were loads of disasters on there and they’re supposed to know what they’re doing, so with a harder bake you’ve done far better! It’s all in the finish Tara. Be it icing or frosting – they hide a multitude of sins. I’m a huge fan of homemade birthday cakes, for me it’s really important. I’ve never had a homemade birthday cake and that makes me sad. Aww I will make you one! Who doesn’t want to celebrate a birthday with food poisoning, right? Hehe. I am sorry you didn’t have one though 😦 Rolled icing is The Best Thing Ever. I used it for the first time yesterday and I LOVE it. I’m thinking I might forget the cake and just make an icing picture. Aww thank you! I think icing will be easier than getting Elsa back. Hehe.